In a nutshell, meetings in Teams are an easy way to give your tired fingers a break and move into a meeting environment. Meetings can be open to everyone on the team, or even just the people involved in a conversation you are having. You can have an immediate meeting where it starts as soon as you hit the “magic meeting button” or it can be scheduled for a future date. A meeting can be in different mediums; including but not limited to video, audio and\or typed (so your fingers may not get a break). Basically within Teams, a meeting is intended to be a bit more formal than chatting, but still allow for a feeling of being informal by the ability to create an impromptu meeting. Click on the Meetings button in the app. Once the meeting occurs, the recipients can either join from within their Teams App or from the calendar entry like other Skype for Business meetings. 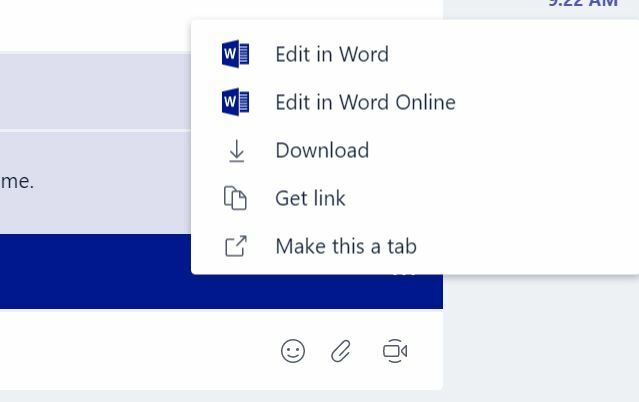 Like Groups and SharePoint, Yammer and many of the other business apps you use to make collaboration easier, you can also add files to Teams. The files themselves, when uploaded, are stored in the document library of the Group that is joined to the team when it is created. Files can be uploaded to a conversation thread, a private chat and to the team file repository in general. When uploaded, the files are stored within the region they were uploaded into. For instance, if a file was uploaded into a private chat window, it will only be available in that chat and not the team file repository (they are autonomous of each other). Like O365 and SharePoint with Office Online Server installed you have document controls on the document where ever you are viewing it from. For example, the controls exist in the conversation thread and the file storage location. You can also share the document from the chat window as well. As you can see from the screen shot above, you can also make the document a tab. This means you can pin it to your conversation window, chat and\or team window. You can edit the file within the tab including co-authoring, download it, rename it and remove it from the tabs. When downloading, it retains the storage location so you can complete your editing within the office client and save it back. When saved, the tab will update with the changes you made. That’s all I am going to cover right now with Microsoft Teams. The app is still being actively updated as it is still in preview. It is slated for general availability (GA) early in 2017. This means that if there is a feature you would love to see, there’s still a chance it will be there. Have ideas or fixes you would like to see for Teams? Make your voice heard with Microsoft Teams User Voice.